The annual NEXTies award show is returning to the Rio Theatre on Friday, March 23, 2018. Now in its 9th year, the event celebrates Santa Cruz County’s talented locals who stand out for their outstanding achievements in industries ranging from food and fitness, to tech and the arts. This year, the Artist of the Year award is going to the one-of-a-kind Ann Hazels! 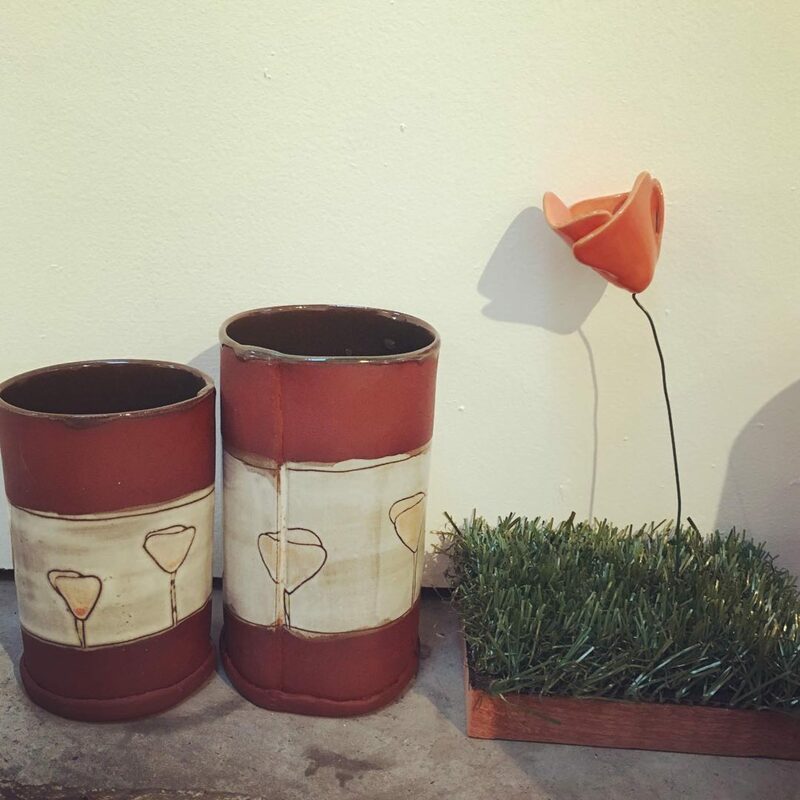 Ann is a ceramist and installation artist and the Director of Radius Gallery at the Tannery Arts Center. She sculpts in earthenware, stoneware, and porcelain that incorporates a mix of repurposed materials and found objects. Her ceramic work has been spotlighted around the world – Ann has exhibited nationally, was awarded a Fellowship at China’s Jingdezhen Sanbao Ceramic Art Institute, and completed two major permanent public art installations in DC. Originally from the Midwest, she came to Santa Cruz as an artist in residence with an extensive background in the business of art. The local art scene has never been the same since. 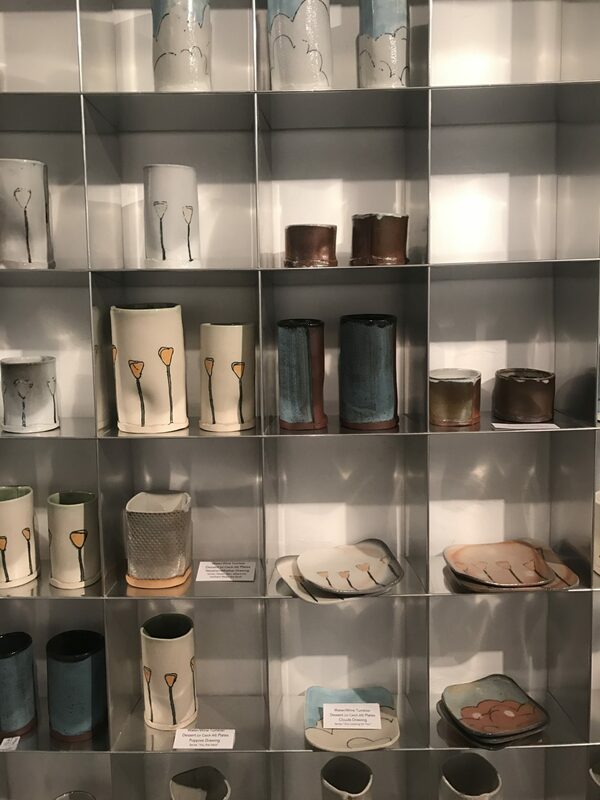 When she’s not in her Tannery studio making magic with ceramic, Ann is supporting other artists and connecting the public to art at Radius Gallery. Under her visionary leadership, Radius has become a welcoming cultural hub featuring local and international artists representing all forms. 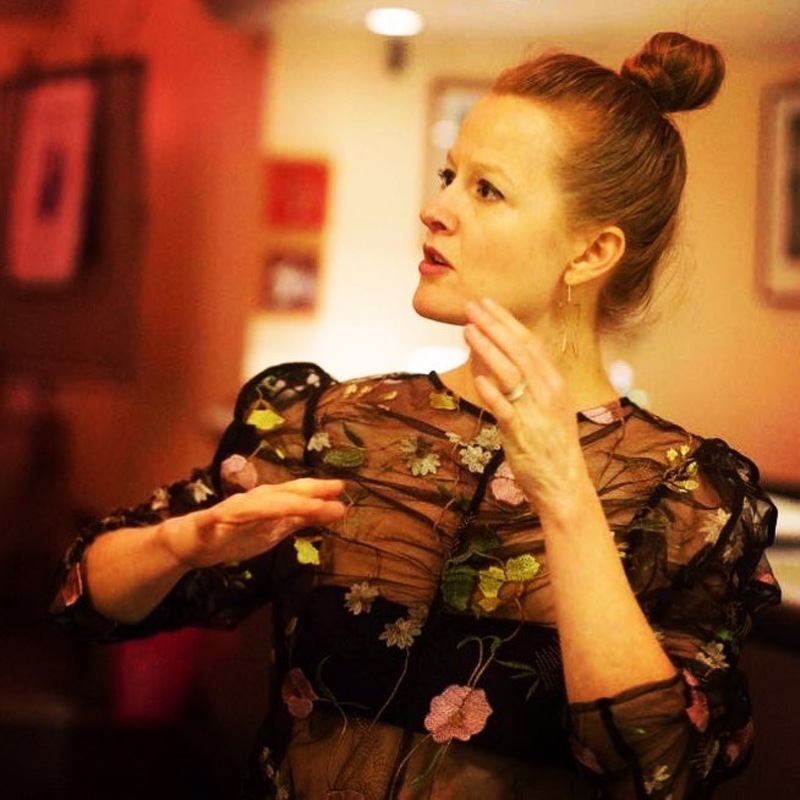 As well as curating diverse visual art, Ann has evolved Radius into an intimate setting for lectures, workshops, and performance art, including live music, dance, and poetry readings. Read on for words from this inspiring 2018 Artist of the Year! Local Santa Cruz: What inspires you as an artist and why do you enjoy working with the medium of clay in particular? Ann Hazels: My surroundings inspire me – people, places, color and temperature. My art represents how space, geography, and environment influence one’s sense of self. I explore the concept that something so boundless can feel incredibly close and personal. Architectural components such as bridges and industrial pipes are used to convey connection and line. A line represents a thread of conversation, the fluidity of sound and voice, and a continuum. My work in multiples shows the impact of time and the significance of numbers. Clay is a material that can be altered in every single state. I love that it is a natural element – it can be used for function/utility and art. Similar to my art, clay is representative of what is around us. It is composed of natural elements, some more refined than others. How has Santa Cruz and the local community influenced your creative work? Growing up in a military family had an incredible impact on how I experience the notions of finding community, adapting to change, and where I call home. Every place I’ve lived, I actively seek out community and how I can contribute. Here I’ve found it in art, work, volunteer groups, outdoor activities, and social circles. Santa Cruz has a wealth of people with a wealth of interests in one of the most beautiful places in America. The Tannery is a large community I am honored to identify with. In my creative work, I play with elemental themes – prominent with water – to draw the parallel that we are all effected by our surroundings, whether cultural or environmental, physical or psychological. Why are you passionate about the gallery experience and how has being a gallery director impacted you as an artist? I feel really strongly that it is my job as a Gallery Director to represent artists and their work, and it is the artist’s job to make the art. It is important for art to be seen outside of a studio setting and in a space that is dedicated to art. This allows for the experience to be focused and uncompromised, intentional and uninterrupted. Art can be transformational, life-changing, profoundly enriching and it is my job to create this space as best as I can at Radius. Please share a bit about the current show featuring Bean Finneran. 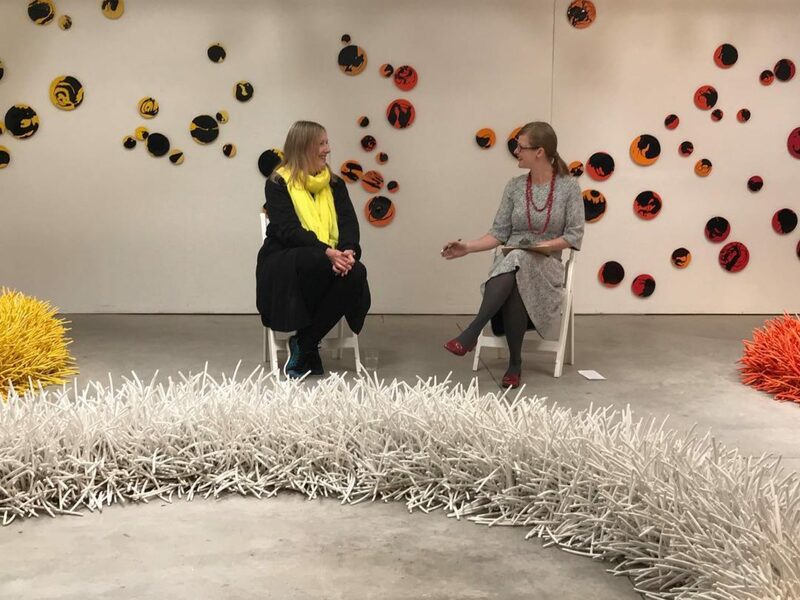 How does this show reflect the unique environment you’ve created at Radius Gallery? The art of Bean Finneran moves us through wonderment, a visual poetry without words. Much like listening to grass blow in the wind or watching sea life pulse in water, you feel a stillness inside you as you witness everything move around you. Her forms suggest fragments of a conversation, sound bites from nature, or layering of language. Upon construction (and deconstruction) you experience the musicality of the work, clay tinking and sliding gently to create forms that reference the vocabularies of geometry and organized chaos. Each sculpture is composed of thousands of handmade ceramic elements, placed one by one, with the shape determined as space and form speak to the artist – no single piece is the same. For Radius, I strive to exhibit stellar art that allows viewers of all ages to think, wonder, and feel – move one deeper into humanity through this powerful form of expression. We are very fortunate to have Bean Finneran showing in Santa Cruz. She exhibits internationally and continues to make a great mark with every show. BIT BY BIT is the largest display of floor installations she has ever created. For a working contemporary artist in her seventies, she is living proof that artists have a lot to contribute to the world.